We have some of the best package deals in the area! Click on each package name below to view the details for each. Clicking on the package name again will close the viewing pane. GOLD: Enjoy a 3 day, 3 night, 3 round golf package for as little as $288 per person* at our Mystical Resort Golf Villas. This includes FREE daily breakfast at IHOP, a FREE steak dinner at Logan's Roadhouse, Free daily lunch at the courses, 2 FREE beers or beverages with each round (excluding the complimentary round), and more during your stay. Enjoy a 3 day 3 night , 3 round + 1 complimentary afternoon round (selection required at the time of booking, if desired) too! SILVER: Enjoy a 3 day, 3 night, 3 round golf package for as little as $258 per person* at our Mystical Resort Golf Villas. This includes Free daily lunch at the courses, 2 FREE beers or beverages with each round, and more during your stay. The daily breakfast, steak dinner and complimentary round are not included but saves you money on your package. 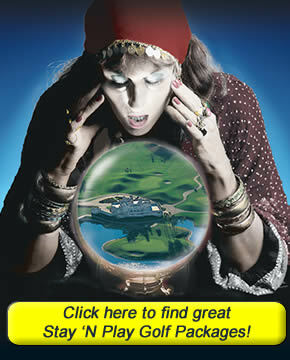 Play each of The Witch, The Wizard and The Man O'War Golf Courses with green and cart fees included. Book a group of 20 or more and we will automatically 'comp' you the cost of one of the golfers. Play any combination of all 3 of our courses - The Witch, The Wizard and The Man O'War Golf Courses - with green and cart fees included. *Cart fees and all applicable taxes included. Rate is limited to the date ranges provided. Price is based upon quad occupancy. Thank you so much for setting up our golf trip. I believe this is our 11th year of coming to Myrtle Beach. I'm so happy that I found your web site. It's made our planning efforts seamless. The accommodations, the courses, and the perks are just the right combination for us. Breakfast, lunch, and the steak dinner at Logan's was the non-golf highlight for us all. Of course the perfect weather this year just topped off a perfect trip. Thanks again, and we'll call early next year for 2018's trip. Just wanted to thank you for a great time. Everything was better than advertised. Thanks again. That was one of the best trips of my life. Unbelievable. Awesome job setting us up. Definitely will going back and will be contacting you again. Thanks! Firstly I want to thank you for everything. We had a great time there last week. It was our first Myrtle Beach trip and we will definitely be back. I will say it took half a round to get used to your grass! Very different than our Jersey grass. Just wanted to take time to thank you for one of the better packages we have ever had. This trip was a memorial to my dad, who passed away in February, and was a very avid golfer. The group included his brothers, sons and numerous friends. To the man there was only praise for the Villas, the hospitality and helpfulness of staff at all three golf courses, the meals and of course the golf (not to mention the beers). My two brothers and I took many package golf trips to Myrtle Beach with Dad and know he would have thoroughly enjoyed this trip. Once again THANK YOU and know I will be booking with you again next year. We played Both Man O' War and the Wizard on July 20-21. It was our first time to Myrtle Beach and wanted to give these courses a try. We are from Nashville and these were by far two of the best courses we ever played. Both courses were in phenomenal shape. The staff at both course were so generous and made sure we were taken care of. We liked the Man O' War a little better, but the greens on the Wizard were in better shape because people were not courteous enough to fix their ball marks on the greens. It is a must play if you are in the area. Just wanted to drop you a line about the golf trip. Everything went pretty well mostly. Everyone at the golf courses were a pleasure to deal with. The golf itself was enjoyable but tough, which we liked. I made a mistake on Friday and went to the wrong course and they were very easy to work with in changing them around and making sure we were taken care of. Overall I would rate everything a 9 out of 10. We did enjoy our vacation and do appreciate everything that you did to help us with it. 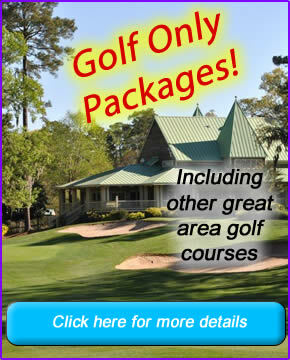 We enjoyed the condo and really enjoyed the golf courses with this package. Great time! First let me say we had an awesome time at this years golf outing. I can't say enough about how impressed I was with how smooth everything ran. Randy played a HUGE part in that and I would like to personally thank him for all he did. I played the Witch yesterday for the first time. I live almost within walking distance and have for 12 years, but have never played the course. Well I enjoyed the staff, and the course. I was treated courteously, and the course is one of the most unique I have played from here to Japan. I will be back - I loved the course design, it rewards good shots and challenges you to think. One of the best golfing days of my life, and I've played since I was 8 years old. I am now 66. Thanks for a great day!